The five String Trios are masterpieces of the young Ludwig van Beethoven as he travels towards the string quartet - however, many musicians and scholars have preferred the mature Trios Op.9 to the subsequent String Quartets Op.18. 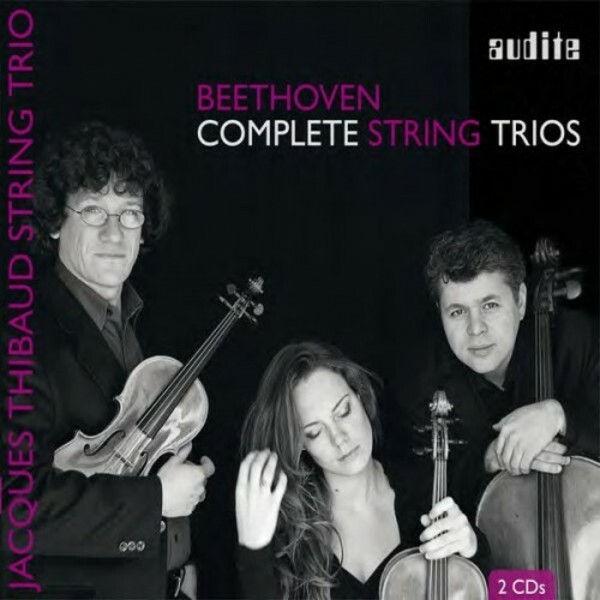 With their new double CD, the Jacques Thibaud String Trio provide an opportunity to rediscover these milestones in the history of the string trio. Prize-winners in the prestigious 1999 Bonn Chamber Music Competition, the Jacques Thibaud String Trio was founded at the Hochschule der K�nste Berlin (today: Universit�t der K�nste) in 1994. In its early stages the ensemble was closely related to Laszlo Varga (solo cellist of the New York Philharmonic, cellist of the Borodin Trio) and the pianist Gyorgy Seb�k. Later on, important artistic impulses came from Adolphe Mandeau and Markus Nyikos. Today the trio consists of Burkhard Mai� (violin), Hannah Strijbos (viola) and Bogdan Jianu (cello).